Offer your school a much needed permanent addition to the athletics program by using our high-quality synthetic ice rinks and all the necessary ice skating supplies and equipment. Artificial Ice Events provides the best synthetic ice on the market today for a perfect custom surface, resistant to extensive repetitive use and all weather conditions. Fit to be assembled indoors or outdoors, our synthetic ice rinks are environmentally stable for long term use, easy to maintain and clean, as well as water and electricity bill-free. Our surfaces provide the much-needed feel of real ice, allowing for any kind of skating event, from thorough hockey training to figure skating. We offer custom packages that include all the equipment needed for a true ice skating experience, from ice skates to rubber flooring and fencing. Many sizes are available for both permanent ice rink sales and mobile installations. 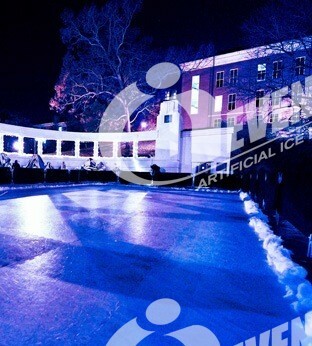 Using their long experience of professional ice skating and the knowledge that comes with it, Artificial Ice Events will help you put your plans and ideas for a school ice skating rink project into action.